It goes without saying that smoking is an extremely unhealthy habit that carries many risks. In addition to causing cancer and heart disease, cigarettes can also damage the eyes. Studies have shown us that smoking cigarettes nearly doubles your risk of developing cataracts. This clouding of the lens can result in vision loss as well as complete blindness when left untreated. This habit also triples your risk of developing macular degeneration. While some age-related degeneration is completely normal, macular degeneration will quickly impair your vision in a short period of time. It was also found that smokers are more than twice as likely to develop uveitis. This eye disease causes an inflammation of the middle layer of the eye called the uvea, producing reduced vision or blindness. Smokers are also at a greater risk for developing Diabetic Retinopathy, another serious eye condition that can result in blindness. In addition, smoking while pregnant can increase the risk of giving birth prematurely. This puts an infant at higher risk for developing Retinopathy of Prematurity, which can be a blinding disease. Along with higher risks of diseases, smoke itself can be irritating to the eye and can lead to dry eye or the worsening of dry eye. Patients with dry eye will experience itching, burning, tearing, the feeling like something is in the eye, and fluctuating vision. To reduce the risk of these conditions, your best course of action is to quit smoking altogether. For example, it has also been shown that quitting smoking even after you have smoked for years can significantly reduce the risk of developing macular degeneration. Quitting can be difficult, but it isn’t impossible. Nicotine replacement therapy is more effective than ever, and it has helped countless patients quit smoking. 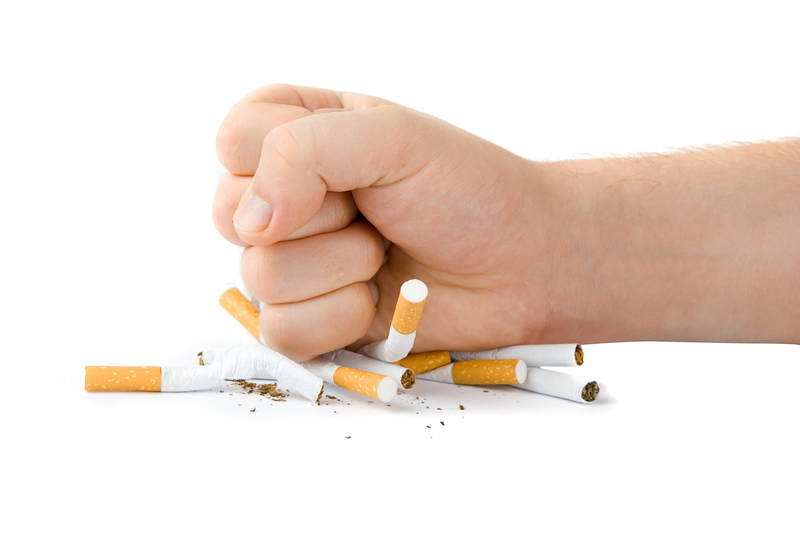 This form of therapy minimizes cravings by giving small doses of nicotine throughout the day. This nicotine usually comes in the form of patches, sprays, lozenges, or gum. The statistics are clear: Quit smoking now, and your eyes will thank you!